It’s been a while since your faithful correspondent watched a proper historical romp and, what’s more, it’s been longer still since I enjoyed one as much as Alatriste (2006) by Agustín Díaz Yanes (Sin noticias de Dios (2001)). Mortensen, a quite superb character actor, as his recent work in David Cronenberg’s A History of Violence (2005) and Eastern Promises (2007) proves, is Diego Alatriste, a former soldier and mercenary who becomes a hero of Spain’s 17th century Imperial wars. 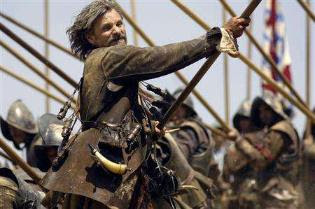 Immensely popular in Spain, thanks in large part to the popularity of Arturo Pérez-Reverte’s series of novels on which the film is based, Alatriste as depicted by Mortensen comes across very much like an Iberian equivalent of d’Artagnan, as created by Alexandre Dumas. The film was the most expensive ever produced in Spain, and took almost five years for Agustin Diaz Yanes to write and bring to the screen. Compressing the principal episodes of the six-book saga, we join ‘Captain’ Alatriste (it’s a nickname at this stage, rather than an actual rank) during the reign of Philippe IV, whom he serves as a soldier and mercenary. Courageous and loyal, Alatriste is nevertheless a tormented man, with his worries for his adopted son, Inigo (Unax Ulgade), who, little by little, is becoming exactly like him and his great love, the Maria de Castro (Ariadna Gil), a fading beauty who is also attracting the king’s attentions. Alatriste by Mortenson does come over at times rather like a Hispanic ‘Man With No Name’ – an anti-hero with swagger. The actor’s Spanish is somewhat Latin-American inflected (it was where he learnt to speak the language, in his childhood), but this does not detract from his performance. The film’s visuals are superb, with much reference made to Spain’s great artist Diego Velazquez, who is referred to several times. The violence at the story’s core is authentically portrayed, with much use of hand-held cameras, and the swashbuckling sword-play is very exciting, choreographed by veteran sword master Bob Anderson. Definitely one for a long Sunday afternoon – you won’t regret it. 145 mins. In Spanish, Flemish, Latin and Portuguese.